In recognition of Fair Trade Month, Marigold Fair Trade Clothing is starting a new blog series entitled: “Fair Trade From the Seed to the Consumer.” Our beautiful, fashion-forward products represent a completely fair trade supply chain, and you can be assured that from the cotton seed to the finished product, your Marigold purchase is helping to transform the lives of workers and their communities. 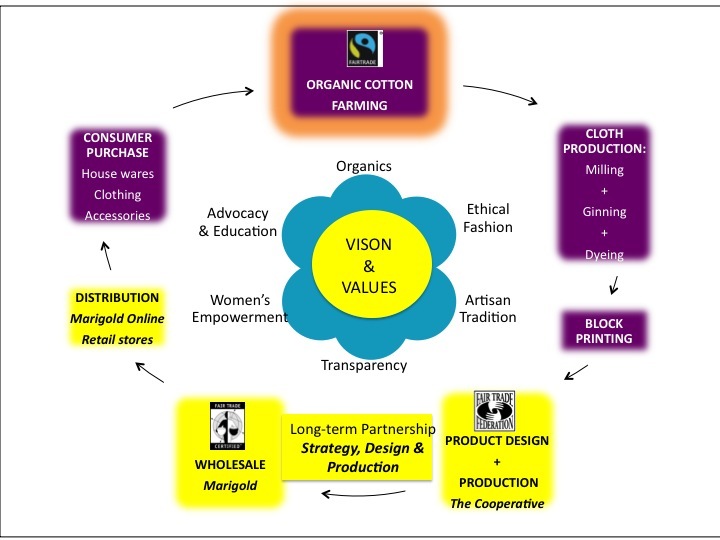 Holding true to our value of transparency, and in an effort to educate and advocate for the Fair Trade model, we are opening up, and explaining, our complete value chain to the consumer public. In Part 1 of our series, we will explore the first link in the Marigold supply chain: Organic Cotton Farming. For the past three years, and especially since the summer of 2010, Marigold has been expanding our line to include more organic cotton products, while staying committed to fair trade and artisan design. We believe that it is important to support farming that does not employ harmful practices and that protects both the environment and the workers. Marigold plays a part in growing the movement by offering clothing and housewares made from organic cotton that does not use agro chemicals that destroy our environment by contaminating water supplies, destroying soil nutrients, and harming wildlife. Along with the environmental impact of industrial practices, farmers also suffer from exposure to chemicals and experience ailments such as severe skin and digestion problems, and fatal diseases, including cancer. In addition to having to deal with on the job health issues, cotton farmers in India often do not receive a fair enough price to cover production costs and many have been forced to borrow money at extortionate rates. Unable to repay debts or support their families, suicide is common, and in the Amravati district of Maharashtra alone, there are 5,000 farmer suicides every year. 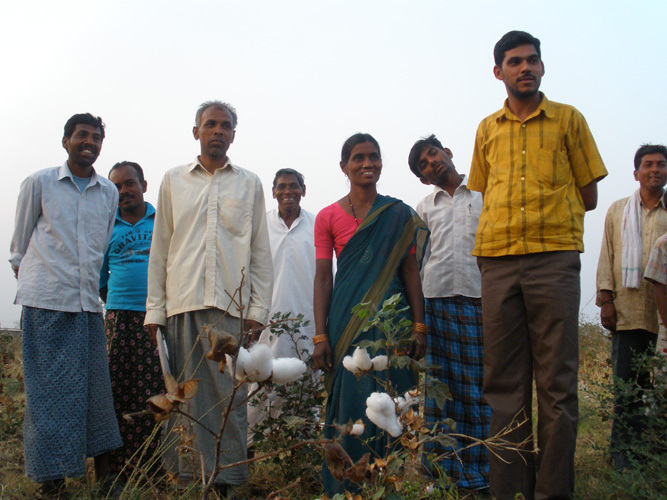 Over the past two years Marigold has been buying our organic cotton from an organization based in Andrah Pradesh that helps farmers to escape the spiraling debt and increase their income by 50%. Since the organization started working in 2006 there have been no suicides amongst the 6,000 farmers we work with. Through our company’s cotton sourcing standards, farmers have regained their dignity through self determination and through fair trading conditions. Stay tuned next week for Part 2: Cloth Production and Block Printing. In the mean time, what are your thoughts on organic farming practices? Do you think it’s important to support the movement through your purchases of organic cotton clothing and other products? Entry filed under: India, Organic cotton, Uncategorized. Tags: cotton, fair trade, fair trade month, farming, industrial, Marigold, organic. Wow! Now we have even more reason to love Marigold! Such an awesome company that makes such beautiful clothes. We are seriously in lurve with the Marigold Jacket (https://www.marigoldfairtradeclothing.com/store/pc/viewPrd.asp?idproduct=6&idcategory=4). Bamboo Bay Blog: Your full comment did not post, please resend! We’d love to hear from you!